Thank you to Sprouts and Acorn Influence for inspiring and sponsoring todays post. Ah, yes, it’s 9:15 a.m. and you were supposed to be somewhere fifteen minutes ago. This post is dedicated to those of us who strive to be planners and usually end up somewhere in survival mode even at the beginning of the week. Here are a few snacks you can stock up on and bring with you each day so you don’t starve amidst the busy! I love snacking on baked goods and other fresh foods, but sometimes life busy days call for quick and easy alternatives. All of these picks are easy to stock up on, vegan-friendly, and minimally processed. I usually shop for groceries at Sprouts Farmers Market, so when I’m doing my weekly meal planning and list-making, I be sure to add one or all of these to my grocery list if I run out! Freeze dried fruit is so easy to pack and doesn’t spoil. They’re like chips except way better for you than chips are. I love freeze-dried mango, banana, and blueberry! Granola is an easy, filling snack. Love the ones by Cascadian Farms! I prefer to eat my granola with something like a coconut yogurt or even some almond milk, but remember, it’s a busy day – no one has time for almond milk! So if you aren’t into freeze-dried fruit, the Annie’s Organic Orchard strawberry fruit bites are a great alternative. They have amazing ingredients and they’re vegan. When I have an inkling of extra time in the morning, I quickly throw some frozen fruit into my bullet blender with a splash of filtered water, ice cubes and maybe some chia seeds and call it a meal! G loves smoothies too so I can share this with her. Ahhhh, the Larabar. It’s seriously one of my favorite snacks. I love that they are vegan, have recognizable ingredients, and are non-GMO. Things that are all very important to me especially when I eat processed food. They are so convenient, so I typically keep 1-2 in my diaper bag at all times if I’m ever in a bind. If you’ve never been to a Sprouts, you definitely need to go if there’s one near you! They have tons of fresh produce that is super wallet-friendly. They carry amazing brands like Muir Glen, Larabar, and Annie’s too. Right now you can save 35% on the “Better For You Brand Sale” October 12-October like I did just recently on all General Mills products. 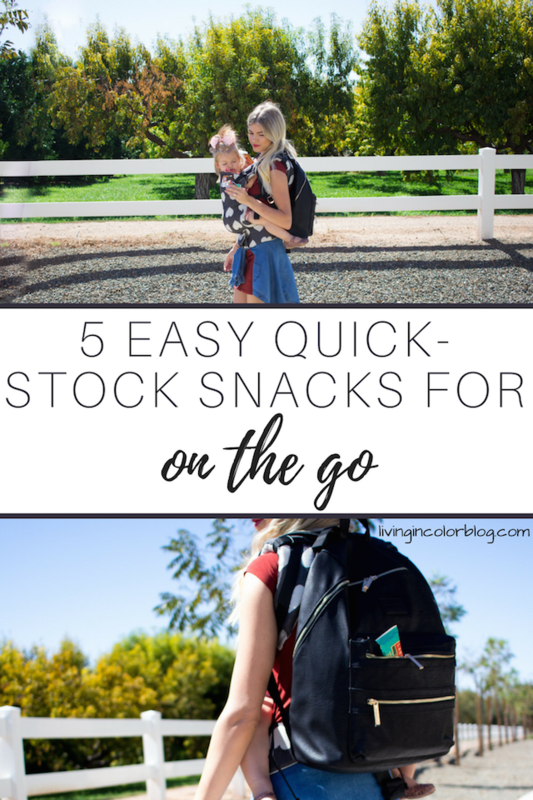 What are your favorite quick stock mom snacks for busy days? I love Sprouts! And Larabars! I just stocked up on the pumpkin spice RX bars today! Love those too! First of all, that backpack is darling. Second of all, I am going to use these snacks for myself (no baby in tow) haha! They sound perfect for a long day at work. I just had a larabar yesterday. I've been hearing such good things about Sprouts and need to check them out! I've never been to a Sprouts but I am now determined to find one near me! This sounds perfect! Sprouts is the BEST!! Such a great post! I love sprouts as well! So many great snack ideas! I love shopping at Sprouts. The bulk foods section is my favorite – I always stock up on granola and yogurt pretzels! You always have the best snack tips! 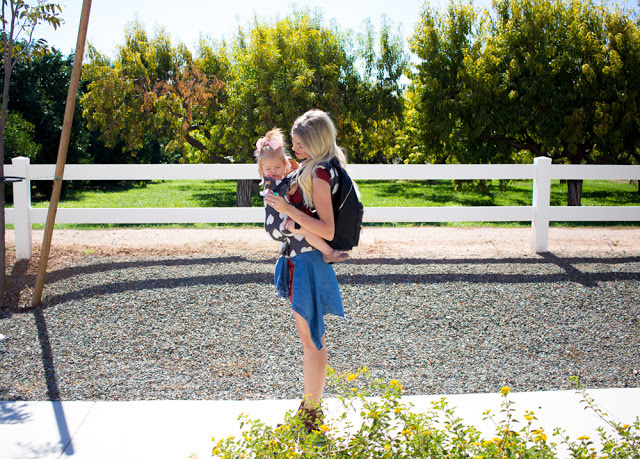 I don't have a little one yet, but these are great ideas for even this girl always running behind! I have never heard of them! I can't wait to check them out! These snacks all sound great! I don't have kids, but need to snack often because I get headaches easily and i love larabars too!!! I love how there are only like 3 ingredients – so special. What great ideas. I also make energy balls for my boyfriend and I. They are easy to make and yummy too. It's always good to have a late afternoon snack. We love Larabar!! One of the few things I could eat while dairy/soy/gluten free! This is so smart! I love bars too and thanks for reminding me about how yummy Lara bars are! Okay, I need to visit Sprouts. And, I haven't tried Larabar either!! I need to Asap. I wish we had a Sprouts here in Omaha! Those snacks sound so good! yes we LOVE all of these!! Lilly is the biggest fan of Annie's and Larabars! These are some great snacks! I love Larabars! They are SO SO yummy. I miss shopping at Sprouts! PS Larabars are the BEST! 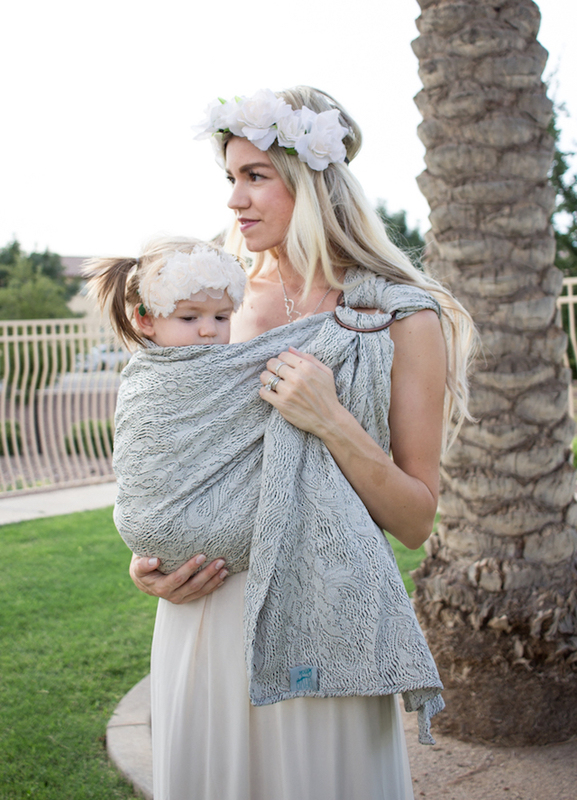 We keep Larabars in our diaper bag a lot too and I BIG puffy heart Sprouts! You gotta have healthy snacks on hand! Larabars are the BEST. I'm not a mom, but I love 'em and so does my hubby! Bookmarking this post, I need to step up my snack game since I'm always on the go! Love Larabars…they have been perfect while on Whole 30. Great snack recommendations.